I mentioned the other week that one of my favorite desserts to make is my 15 minute chocolate lava cake. The 15 minutes is both the prep and baking time. If you haven't tried it - I highly recommend you give it a try. 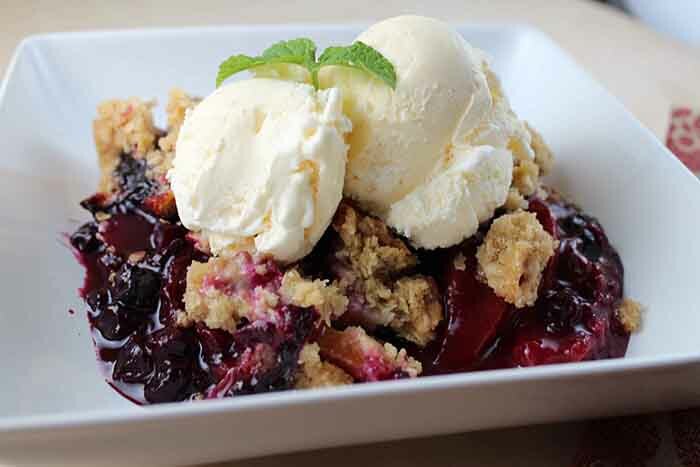 One of my other favorite desserts is BLUEBERRY CRISP. Just like the chocolate cake, it is super easy, and does not take much time at all to put together. Prep time is around 10-15 minutes - and it bakes for approximately 25 minutes (depending on your oven) - so in less than 45 minutes you can have a delicious dessert. In small saucepan, put frozen blueberries, sugar, lemon juice, zest, and corn starch over medium heat. Stir occasionally, and after a few minutes a few of the berries will begin to breakdown, along with the juices to make a sauce. You only want to cook it as long as needed to create what looks like a pie filling - not too long or all the blueberries will turn to mush. Pour the mixture on to a plate to allow it to cool. While it is cooling, put together the topping. Put the oats, brown sugar, flour, cinnamon in a bowl and mix them up. Then, cut the cold butter into chunks and put in the bowl. With your hands mix the butter into the oat mixture. You will want a clumpy mixture (more of a crumble topping). Now, put the blueberry mixture into a baking dish. I use one I got from my grandmother, but one like this would work. Then, sprinkle the topping on top. Place in 375 degree oven for approximately 25 minutes. You can tell it is done when the blueberries are bubbling up on the sides. This recipe was adapted from one of my favorite cooking books, and one I would highly recommend it for anyone who wants to learn to cook - and especially learn to cook from scratch. My husband and I got this book when we got married - and we are on to our second copy because we used the first one so much it fell apart. *I buy my blueberries fresh and freeze them. I think they are much better than the blueberries in the frozen section of the grocery store. Also, sometimes I mix in some frozen cranberries. 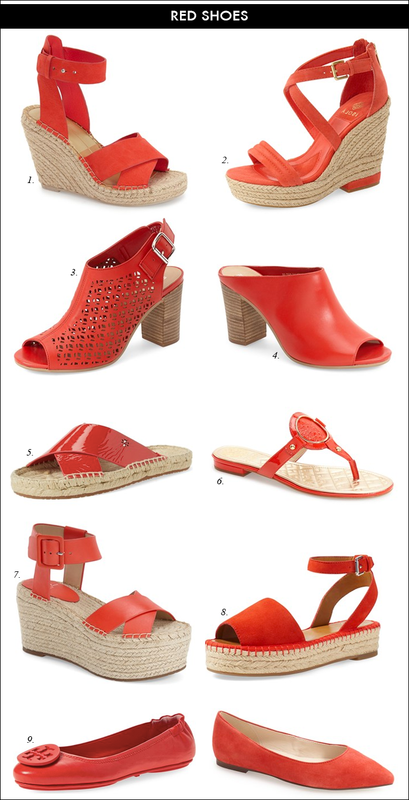 So many cute red shoes. I don't think I have ever had red shoes but need to remedy this asap. Thank you for giving me a place to start!